Last night we opened the Schug 2010 Rouge de Noirs. We tried it and purchased a bottle in December 2013 when we were in Sonoma after Jon ran his first marathon. This wine is 100% Pinot Noir, and produced using the Saignée method. Due to a 3 day cold soak of the juice and the skins, it is much darker than the typical Brut Rosé. This very dry sparkler has a medium raspberry color, light bubbles, and flavors of yeast, raspberry and light spice. It was delicious – certainly drinking very nicely right now. My regret? I wish I had more! What are you sipping tonight? Have you ever stared death in the face? I have! 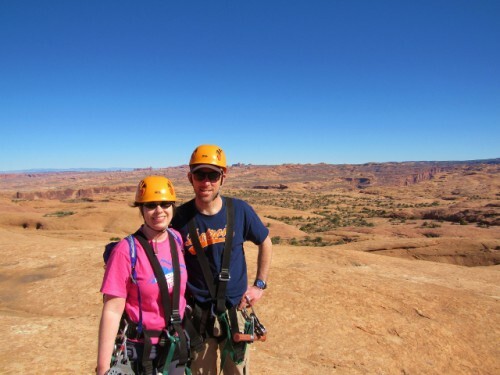 Ok, so perhaps I’m exaggerating a bit, but Friday morning was our zip-lining adventure! I had been alternating between looking forward to it, and absolutely dreading what was sure to be my impending death. 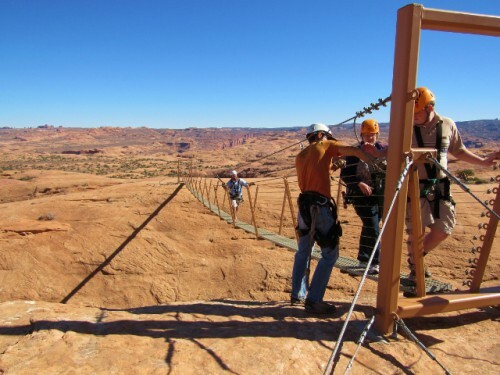 Jon had seen the zip-lining shop when we had been in Moab the year before, and really wanted to try it. I said I would, even though, as you may remember from some of my previous posts, I have a very healthy fear of heights. 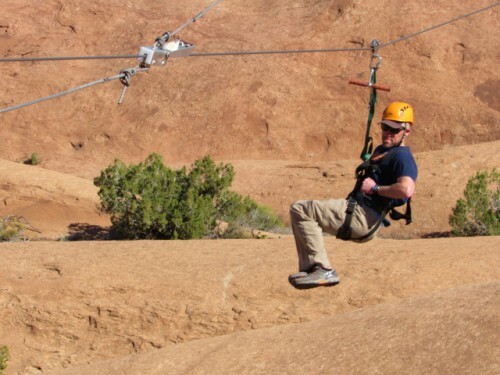 But I like to challenge myself, so I purchased two non-refundable tickets to a 6 zip-line adventure, complete with an off-road UTV (Utility Terrain Vehicle) ride up to the zip-lines, and a trek across a suspension bridge. Of course, I hate wasting money, so I knew if I made the purchase, I was not likely to chicken out. As we were getting ready, I started getting really nervous. Jon told to try not to think about it – maybe listen to my audiobook? My nerves abated as we walked across the street to the shop, but I got nervous again when signing the waiver. I went and sat outside to wait for the safety chat and ponder my impending death. Shortly the other soon to be dead tourists all assembled outside and our guides – Chris and Jake – showed us how to get into our harnesses and helmets. 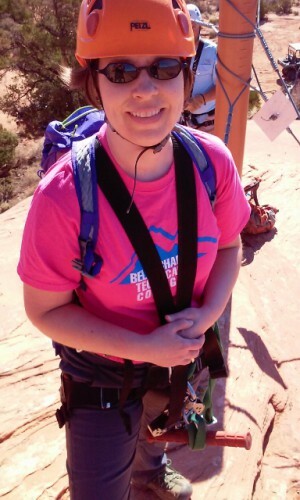 I snugged my harness up as much as I could, knowing that I was still a goner. Soon we bundled into two UTVs and headed up the mountain. The trip was exciting and scary at the same time! Chris explained that in the world of off-roading, this road would be considered a 4 on a difficulty scale of 1-10. It seemed like a 9+ to me. He explained how the zip-line company came to be, and the fact that it is located on private land. He also explained how the zip-lines were engineered and their safety features. I started to feel a little more comfortable, because lots of the reviews said the trip up to the zip-lines was scarier than the zip-lines themselves. I might actually live! Me before my first zip – how green do I look? Jake (one of our fearless guides) zipped first so he could operate the braking system for the rest of us. I was relieved that I didn’t have to try to stop myself… Chris asked who wanted to go first and a 12 year old kid volunteered (I am not an early adopter…). He looked like he was having fun! I volunteered to go third, afraid that if I waited too long I would lose my nerve. But I did it! I screamed a little bit after I first stepped off, but I did it! Once Jake had stopped me at the other end, he had to remind me to let go of the handle… But I did it! And it was fun! 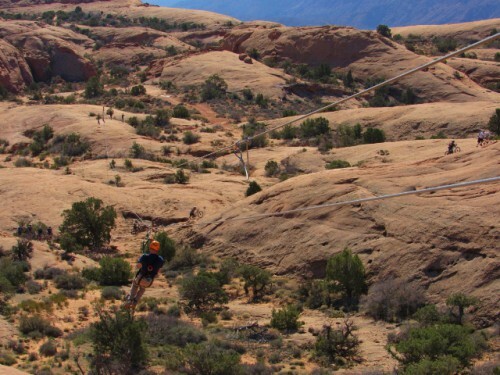 The zip-lines get a little longer and faster from the first one – they are all named for their successive features and challenges. The longest zip- Home Run – is 1300 feet long. Each is unique, some are steeper, some are windier (so you spin more), but they were all fun. In between zip-lines, there are short hikes, including one with a suspension bridge (which looked totally safe but was still scary for me! ), and amazing views. 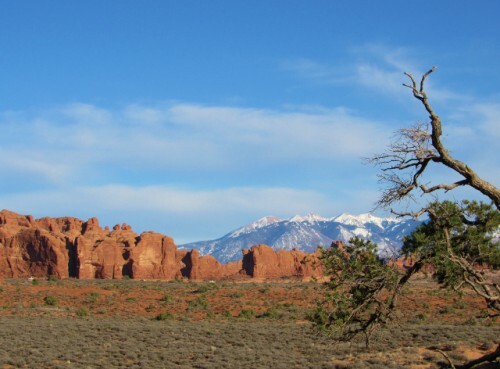 We got a bird’s eye view of Moab, and could even see several of the rock formations in Arches National Park – 10-15 miles away. We Made it over the Suspension Bridge! The course is near other UTV routes, so we saw some of the off-road tours go by, and the last zip-line goes right over a mountain bike route, so we got to fly over top of several mountain bikers pushing their bikes up a steep section of slick rock. Jon zipping the last zip – Home Run. I took video with my camera – I don’t have a GoPro, so I just hung it around my neck and pressed record, hoping the camera wouldn’t flop around too much or turn around on my body…. I think it worked pretty well. The video below is me on the last zip-line – Home Run (bear with the slow start…). I didn’t want it to end. I was ready to keep going all day long! But soon we had reached the end of the sixth zip-line, and Chris and Jake went to go fetch the UTVs so they could drive us back down the hill. Which again, was a trip that was scarier than the actual zip-lining. 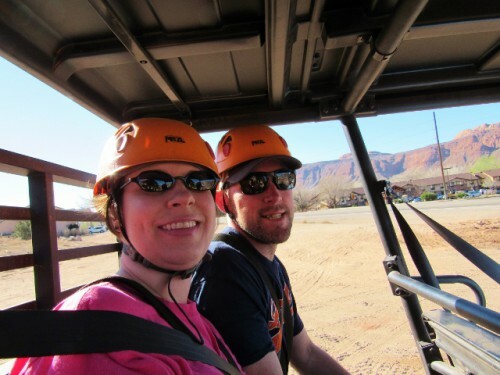 The UTV Ride down the hill – it was pretty steep! I was very proud of myself for doing it and not chickening out. It was exhilarating being able to conquer my fear of heights and discover that something I was terrified to do is actually really fun! Chris and Jake were great – very supportive and it is clear that they get a kick out of helping someone get over their fear as well. I loved this adventure! 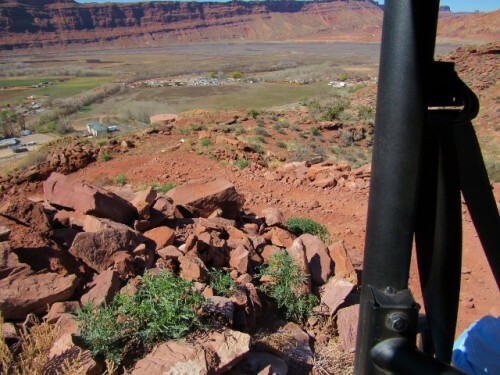 Moab 2015: We Made It! It was time! To make our way to Moab that is! We couldn’t wait to get back there after so thoroughly enjoying our time there last year. We stopped south of Salt Lake City for a quick lunch and some snacks, and then got on the road for the trip down US Highway 6. Highway 6 is the main highway between Salt Lake City and Moab, and used to be a main thoroughfare between the Midwest and California, until it was bypassed by I-70. It is a very winding highway that is often only one lane in each direction, with passing lanes at regular intervals. It winds through the city of Price, Utah, a mining town that might be fun to pass a day in. Price has a mining museum and some dinosaur attractions, commemorating the fact that many dinosaur fossils have been found throughout the area. That said, Price seems like a town that time forgot, at least the sections visible from the highway. Lots of run down homes and empty buildings. Further south from Price, Highway 6 also passes by the Cleveland-Lloyd Dinosaur Quarry, which is still being quarried for fossils today (that would be cool to visit). I hadn’t heard of it before, so did a little research on it later. It was an uneventful drive – we did end up seeing 3 pronghorn and 3 prairie dogs (no photos as we blazed by at 65 mph)… one day I will get a good photo of pronghorn in the wild. 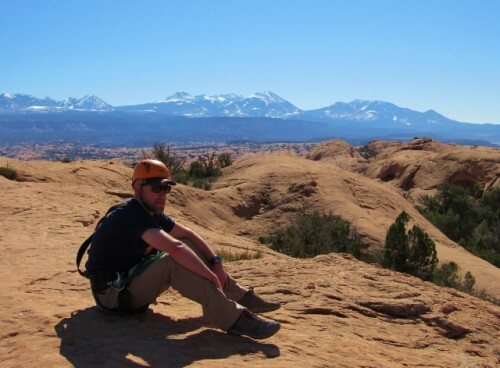 We ended up in Moab right about 4 pm, got checked into our hotel room and immediately changed into hiking clothes. We were at Arches National Park at 4:20! 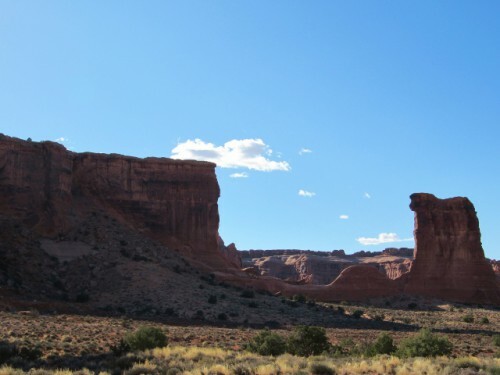 We stopped at the first trail head in the park, the Park Avenue hike – an easy 2 mile out and back through a wash beneath gorgeous sandstone formations. Jon taking in Park Avenue. The Park Service has Park Avenue listed as a moderate hike, but that is really only because it has a set of stone stairs at the beginning of the hike. If you started the hike from the second trail head, you could do almost the whole hike without the stairs. Much of the hike is in shade, which made it relatively cool (I was wearing shorts and had to put on a fleece). Sheep Rock, from our Park Avenue hike. After our Park Avenue hike, we drove down to the Balanced Rock viewpoint. 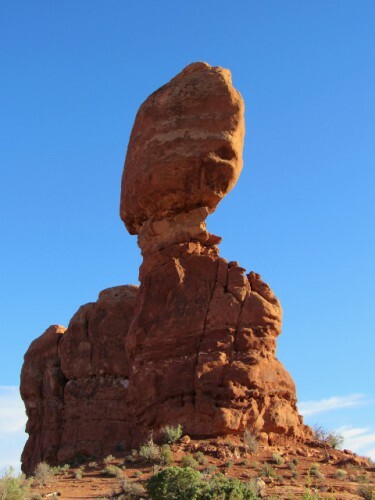 Balanced Rock is one of the most recognized features in the park, and it is an easy walk on a paved sidewalk (total round-trip distance 0.3 miles). I can’t get enough of this view! Balanced Rock was great, but it was dinnertime, and we wanted to make sure to get a place at the Moab Brewery, so we headed back into town. The brewery wasn’t nearly as packed as it was last time for some reason, so we were able to snag a table right away in the bar. Jon ordered the Black Imperial IPA that he had last time we were there, and our server told him that the latest batch was hit or miss, due to some weird, unknown problem during bottling. He said that Jon was welcome to try one and give it back if it wasn’t good. We appreciated his honesty and the commitment to a quality product, so Jon ordered a Hopped Rye beer instead and a veggie burrito. He loved both. I had the Dead Horse Amber, which was sold out last time we were there, with a Reuben sandwich, both delicious. We enjoyed our beers, and both had seconds, with Jon ordering another Hopped Rye and me getting a Hefeweizen. After the brewery, we headed back to the hotel for a relaxing evening. We had a full day of adventuring coming up, including zip lining! I get up for just a minute and this happens in my spot! 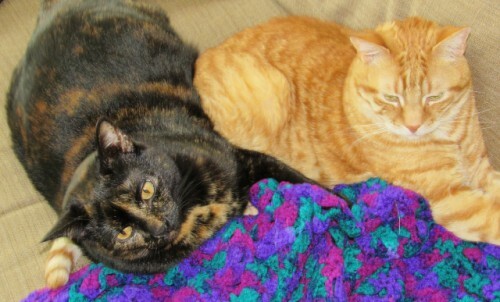 I love when Coraline and Oliver are getting along. It’s getting close to the 3 Day Weekend! 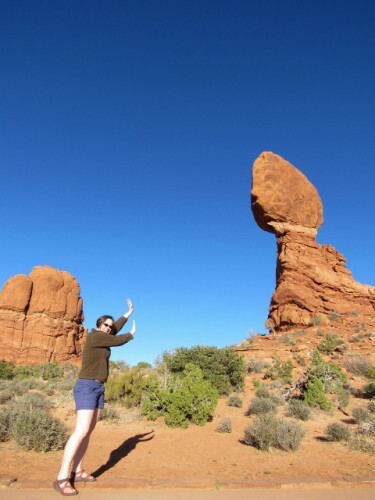 Moab 2015: 3 Mormons and a Catholic. Buildings! 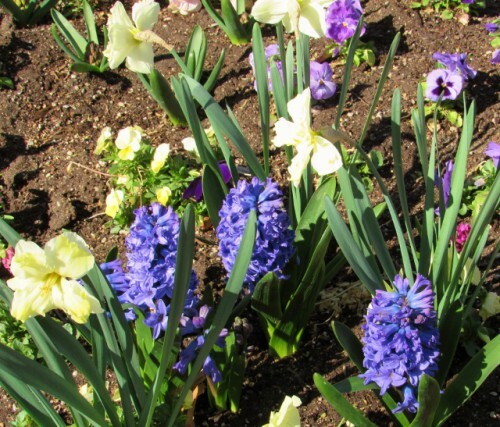 If you had a morning to do some sightseeing in downtown Salt Lake City, where would you go? We began our day at Temple Square to see the Salt Lake Temple, arguably the most famous Mormon Temple in the world. Non-Mormons are not allowed inside, but you can tour the grounds and check out some of the other buildings. We strolled around for a short while to get some photos of the Temple, the Assembly Hall and the Mormon Tabernacle Choir building. The choir practices in the afternoon, but we didn’t want to hang around that long. 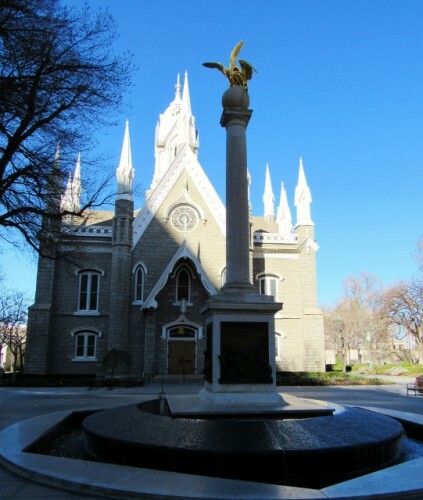 The Salt Lake Temple took over 40 years to build – it was started in 1853 and was completed in 1893. It was designed by Truman O. Angell, one of Brigham Young’s brother-in-laws, who was also the architect for the Lion House and the Beehive House. 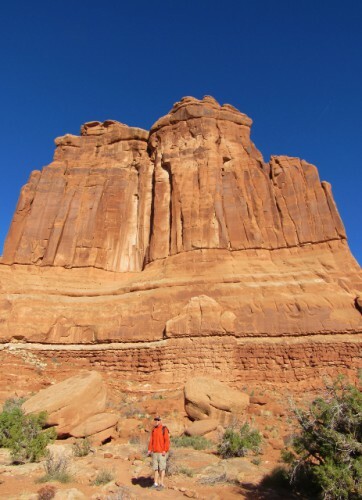 Construction originally began with sandstone, but had to be halted during the Utah War – the foundation blocks were buried to avoid being a target during the conflict. If you haven’t heard of the Utah War, it is the conflict between the Mormons and the U.S. Military that led to the massacre of 120 California bound settlers by the Mormons that is known as the Mountain Meadows Massacre. But I don’t want to get into that here. 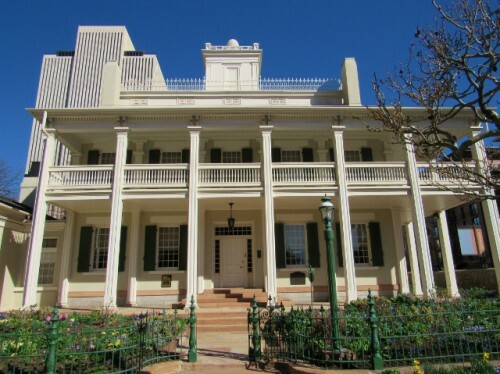 When they resumed building after the Utah War, they discovered that the sandstone had cracked, so they replaced much of the sandstone with gray quartz monzonite and built with it going forward. The stone has the look of granite. 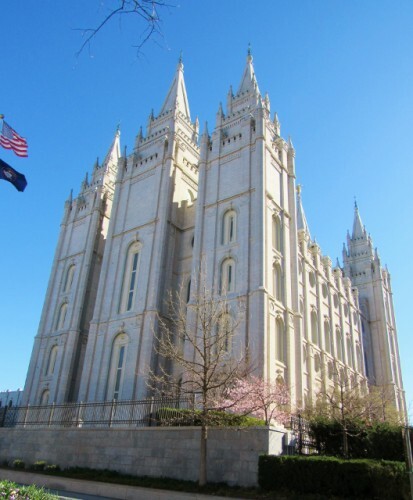 The temple is 222 feet tall and has several ornate pinnacles. The temple is absolutely stunning and so large that it is next to impossible to get it all in one photo. 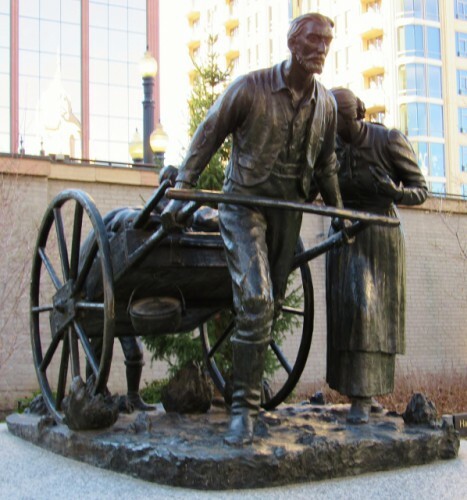 A statue commemorating the fact that many Mormon Pioneers made the journey on foot with their only belongings in a hand cart. After the temple, we walked two blocks down the street, past the Mormon Church Administrative Offices, and saw the Lion House and the Beehive House. They are next door to one another and were built by the Mormons for Brigham Young. The Lion House was built in 1856, and has 20 bedrooms. 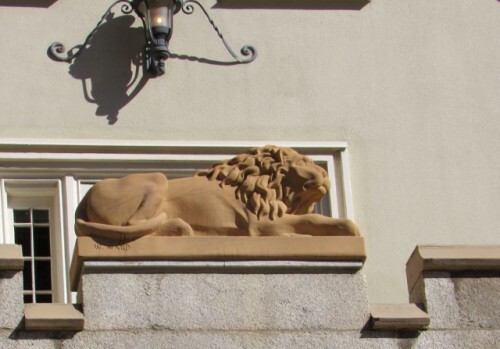 It was named for the large statuary lion that sits above the door, although some say the lion is there because Brigham Young’s nickname was the lion. 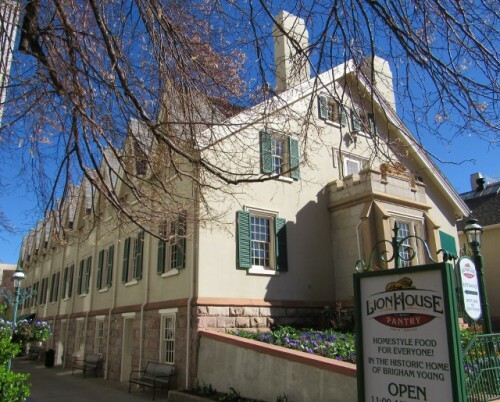 The Lion House housed several of Brigham Young’s 55 wives and 57 children, in a long three story building with 20 bedroom suites along long main hallways on the second and third floors. The basement houses a dining room that is open to the public today. It serves comfort food, but no alcohol or caffeine, in keeping with Mormon customs. Only the dining room is open to the public, but the Mormon church rents the Lion House out for events, so you can sneak a peak at the interior on their website. Next door is the Beehive House, which was Brigham Young’s office, as well as being the residence for one of Brigham Young’s most senior wives and her nine children. It was built between 1853 and 1856. A brief 20 minute tour is available for free, provided by Mormon missionaries, called Sisters, who serve as docents for the tour. I warned Jon ahead of time that the docents are known to proselytize, and after originally saying he wanted to wait outside, Jon grudgingly agreed to do the tour with me. “You can put up with it for 20 minutes,” I said, “For me.” What a guy! Our docents were from Arizona and Italy. They let you know at the beginning of the tour that they will be sharing information about their faith, but didn’t give the hard sell to anyone on our tour (there were six of us). We wandered around the rooms, stopping briefly in each one, admiring the furniture and hearing some brief information about the Mormon belief system. Our docents did not know much beyond the script of their faith. They didn’t know who designed or built the Beehive House, whether any of the furniture was original, or even how many wives or children Brigham Young had (although I do suspect they might be instructed to tell tourists they don’t know the answer to the wives/children question, in order to distance the Mormon church from its controversial polygamist history). 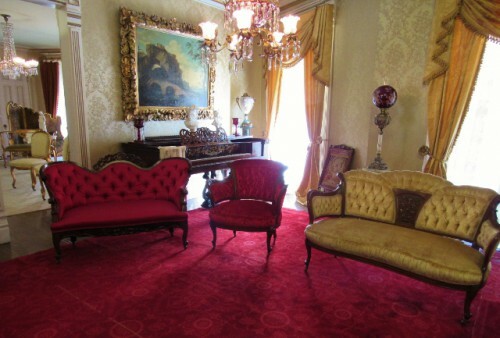 All in all, it was a historic home tour unlike any other I’ve experienced. The home was really just the backdrop for the explanation of their faith, rather than the star of the show. I would have preferred if they would have explained why they built the home with a beehive on the top, or beehive accents in the home (the newel posts are carved beehives). 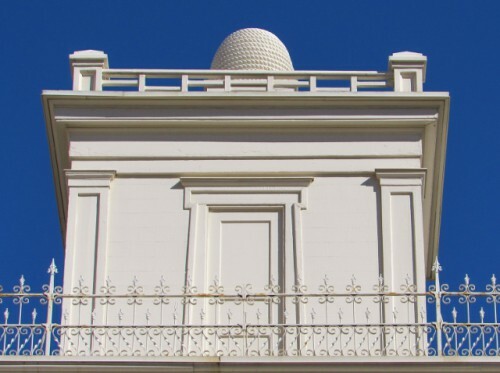 The beehive has been a religious symbol of industriousness since Roman times, and the word Deseret, used by the Mormons to describe their proposed territory during the 1800s, means honeybee. It also would have been nice if the sisters explained anything about the business that Brigham Young conducted from the home, or when it ceased to be a home and office and became a “museum.” But, based on the reviews I had read, I really didn’t expect much history from the tour, so it is hard to be very disappointed. To be clear, all of the historical information in this post was gleaned from the internet. 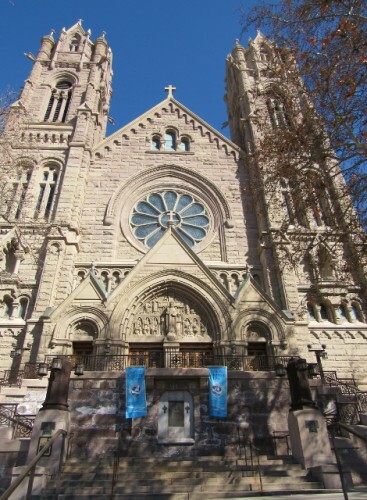 Our last stop of the morning was a couple of blocks down the street, at the Cathedral of the Madeleine, Salt Lake City’s Catholic Cathedral. 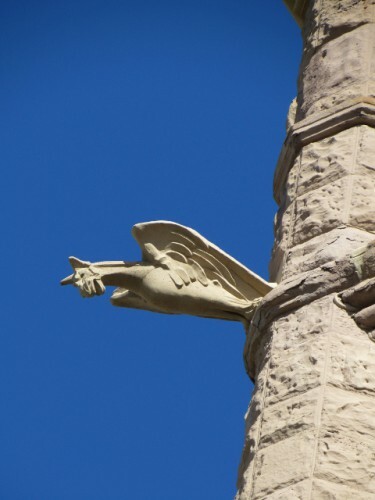 It is stunning, constructed in the Neo-Romanesque style in 1909, with the most exquisite gargoyles flying off the towers. We didn’t go inside, instead just admiring the outside for a few minutes before heading on our way. 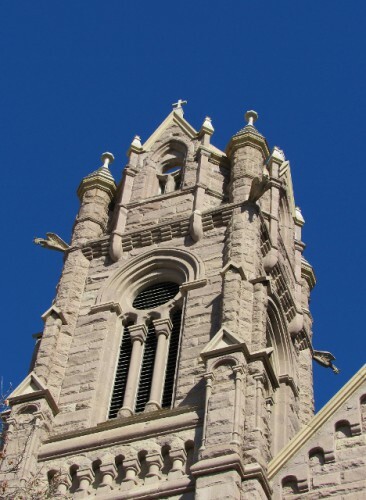 One of the towers of the Cathedral of the Madeleine, with its flying Gargoyles. With that, we headed back to the car, which was still parked in the hotel garage, and headed out for the almost four hour drive to Moab. 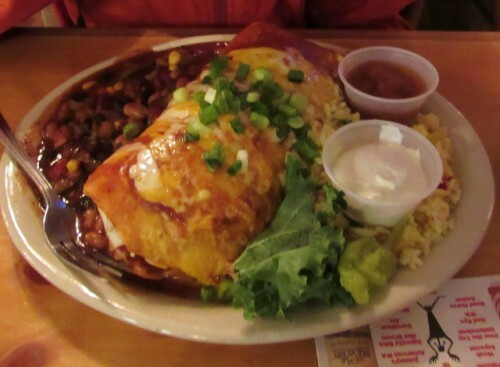 After a day of hiking and sightseeing, what do you crave most? If you said some good food and a beer, we have something in common! After we wrapped up our visit to Antelope Island, Jon and I were tired and hungry. We made our way to our hotel for the night – The Plaza Hotel in downtown Salt Lake City. I wanted to check out some of the historical sites downtown before we made the drive to Moab, Utah the next day! The Plaza Hotel was great – I reserved a small queen room for $100, right next to the Mormon Temple and very close to several other historical attractions. The accommodations were good – the room was cozy, but were weren’t going to be spending much time there. We checked in, changed, and were on our way again to the Red Rock Brewery in downtown Salt Lake City! Considering that it was a Wednesday night, we were unprepared for how busy it would be! They told us it would be a 25 minute wait, but it ended up being a little more than 45 minutes. Jon was not happy, and I was just plain hungry… But we had walked the half mile there, so we didn’t have an easy option to just get up and go. When we were seated we didn’t have to wait long for our server to take our order. I ordered the Amber Ale and a steak salad. 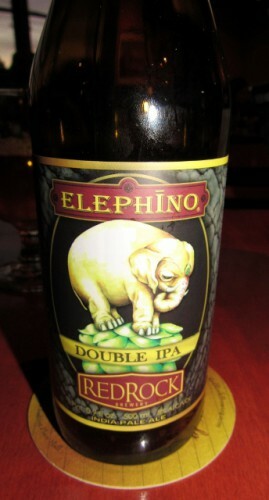 Jon ordered the Elephino Double IPA and a Cobb Salad to eat. My first beer was good, nothing spectacular but solid. 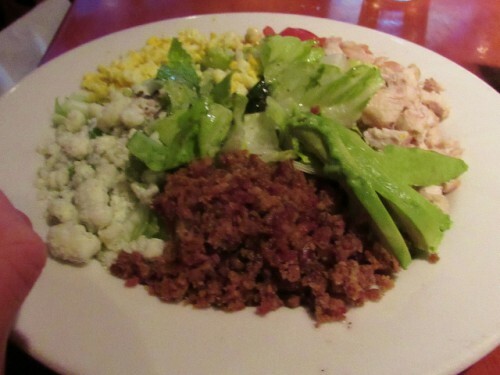 My steak salad was excellent! Jon wasn’t happy with his first beer, an IPA – I actually liked it because it wasn’t super-hoppy, and because it had an elephant on the label (I can be swayed by such trivial things…). 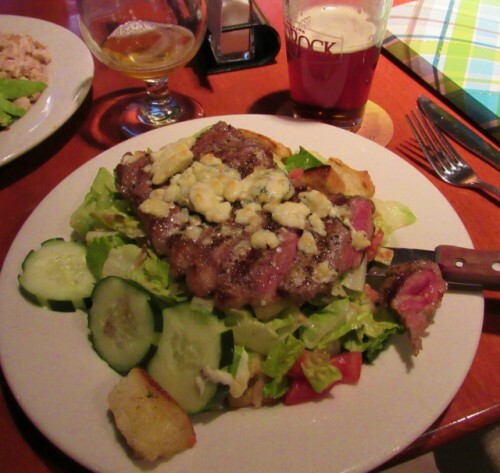 My Steak Salad – along with my Amber Ale and Jon’s Elephino IPA (he wanted me to finish it because I liked it more than he did). We each ordered a second beer – mine was a 5 oz Honey Wheat. It was horrible. It tasted like Pabst, or something similar. It was actually the worst beer I have ever had in a microbrewery – I was so disappointed. Jon on the other hand, loved his 20th Anniversary Imperial Red – it had all the hops he was craving. After dinner, we walked back to the hotel, vegged for a little while and hit the hay. We needed to be rested for a full day of touristing! It’s been a long week… I am nearing the home stretch of a big recruitment process to hire my next boss, but that has meant several long days. I’m ready for the weekend now! To relax after my long day, I’m sipping on the 2012 Three Vineyard Riesling from Chehalem Winery. It has a crisp minerality that is balanced by sweetness, something that is unusual in Northwest Rieslings. There are flavors of tropical fruit – I picked up pineapple – with wet stone. Even though it was raining and I was feeling the need to get bundled up against the cold, this crisp wine really hit the spot and reminded me that summer is on its way. This wine contains 10% alcohol and 1.1% residual sugar, and is sourced from all three of Chehalem’s estate vineyards: Ridgecrest, Stoller and Corral Creek. Have you had the 2012 Chehalem Three Vineyard Riesling? What did you think?